This is the question Jesus asked his first disciples, Andrew and John. It is the question that Jesus addresses to every human heart. "What are you looking for?" Beauty, truth, love, life, happiness? Ask yourself deeply: What is it my heart yearns for the most? Actually, it is all of the above and more. There is in every human heart a desire for the infinite, for more, for a fulfillment we cannot even name. Each of us is searching not for "a what?" but for a "Who"! In the words of Pope John Paul II, "Jesus Christ is the answer to every human question and longing of the heart." When Jesus asked Andrew and John: "What are you looking for?" they responded, "Teacher, where do you stay?" Jesus offers an invitation to share his very person with them in the words: "Come and see." Jesus Christ is the same yesterday, today and forever. Therefore, if you are seeking Him, He says to you today: "Come and see where I stay; come and know me; come and share the depths of my heart and life and mission." We, as Hermit Sisters of Mary, are seeking God revealed in Jesus Christ and made known in the Catholic Church. 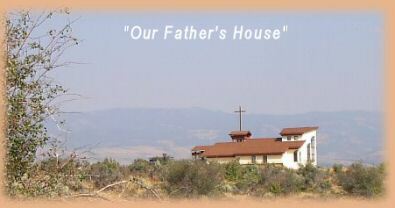 We are a Catholic community of Hermit Sisters living in the desert mountains of rural Idaho in the United States. Our home is called “Marymount Hermitage.” We are not cloistered religious, but our way of life is strictly contemplative. We live by The Rule of St. Benedict and model our lives after the Desert Fathers of the third century in Egypt. While we have a great respect and love for the ancient traditions of hermits, we also try to respond to the Holy Spirit enabling us to live authentic contemplative lives of prayer in this day and age. In this website, you will hear echoes of Jesus saying to you: "Come and see." We offer this humble outreach to you to share with you how we have sought and found Jesus Christ in a life lived according to the Gospel, in the heart of the Church, in the hope of everlasting life for ourselves and for all, through lives of prayer and penance, silence and solitude, community and hospitality, study and manual work. If you feel called to join us, we welcome you to become acquainted with us and will try to answer your questions. If you are seeking a place for prayer and retreat, we have accommodations for you. If you would like to receive some of the beauty of our desert way of life, steeped in the Lord, you can purchase music CDs, flower cards, handmade rosaries and baby gifts by clicking on the gift shop button. Thank you for searching. If you are looking for Him, it is because He has already been calling your name. Let us pray for each other that we may find everlasting life in Christ Jesus the Lord. © Marymount Hermitage, All Rights Reserved.